Environmental defenders from 19 countries shared successes, strategized about new challenges, and inspired each other. 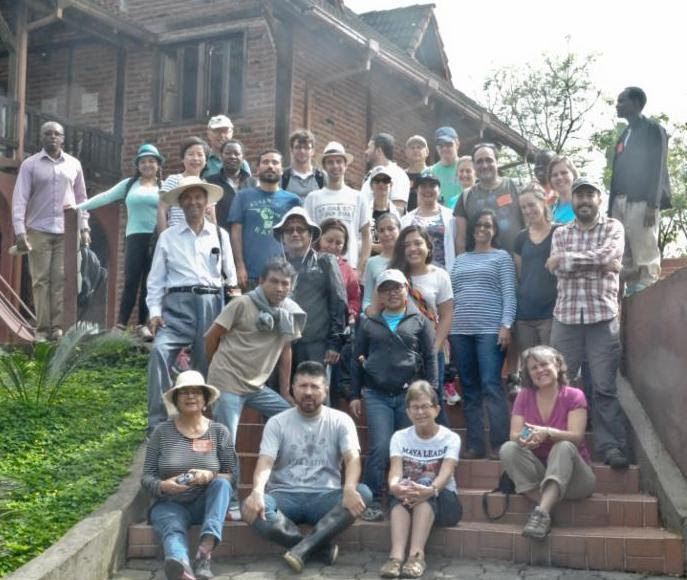 Two substantial earthquakes rattled the meeting site at Hosteria Sapos y Ranas in San Miguel de los Bancos, but did not stop participants from collaborating at an outstanding meeting. Long time ELAW partner Manolo Morales and his organization, Corporacion de Gestion y Derecho Ambiental (ECOLEX), hosted the meeting and did a great job. Pushing past challenges such as securing visas, tracking down lost luggage, and overcoming power outages, they took great care of all visitors. We enjoyed learning about environmental successes: strong progress toward meeting Germany's goal of obtaining 80% of its energy from renewable sources by 2050; communities in Guatemala asserting their collective rights to prevent mining abuses; Mexican advocates protecting free-flowing rivers from short-sighted hydro projects, and more. We also heard about new challenges: coastal communities in Honduras being forced to relocate because of rising seas; China's new law aimed at making it more difficult for organizations outside China to collaborate with Chinese partners; and the growing threat of attacks on ELAW partners around the world. Participants worked hard to replicate successful strategies and collaborate for greater impact. We were inspired by seeing that in all corners of the globe, skilled and committed advocates are working to build a greener future. By linking across borders and working together, we become stronger and win more victories. Thanks again to ECOLEX and participants in ELAW's 2016 Annual Meeting!